You know their names if you are a car aficionado: Richard Rawlings, Aaron Kaufman and Christie Brimberry. They are part of the team at the Gas Monkey Garage in Dallas, TX and the stars of Fast N’ Loud show on the Discovery Channel, Monday nights at 9:00 p.m. EST. CentiMark Corporation Executives presented a donation to Gas Monkey Foundation for Alzheimer’s research. ( above, L to R) CentiMark’s Keith Battenfield, John Scanlon, Bob Penney, Mark Cooper, CentiMark President & COO Tim Dunlap, Gas Monkey Garage Richard Rawlings, Steve Ferencz, John Godwin, Ken Zmich, John Heisey, Bob Rudzik. 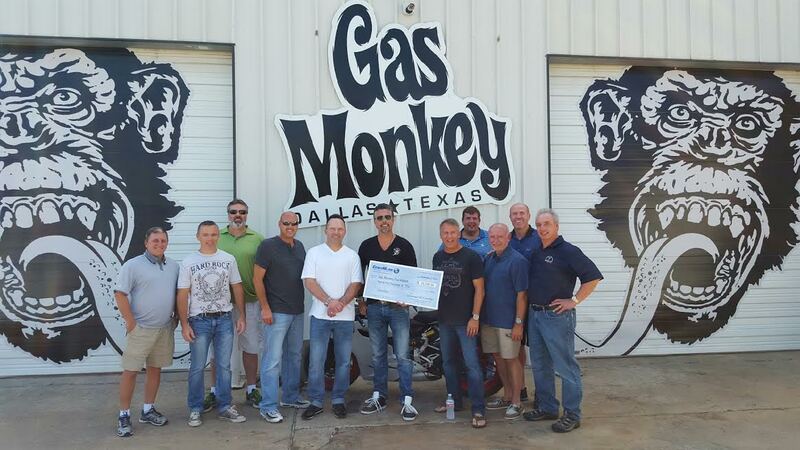 The CentiMark Executive team recently traveled to Dallas for a visit to the Gas Monkey Garage and to donate to the Gas Monkey Foundation .